Gradius 3 SNES Super Nintendo Game Cartridge Cleaned Tested and Guaranteed to Work! The gentle Gradians thought they were cured of Bacterion's contemptible curse after generation of germ-free living. Guess again! That wretched fiend is once again wreaking havoc on Gradius and the surrounding planets. It's your destiny to put an end to it. Unless maybe you think life as an amoeba would be pleasant! In the final forum, you'll have to be as tough as Orakian ore to confront Bacterion and disintegrate its hailstone of a heart. If you do, all that is good in the universe will breathe a sigh of relief. And if you don't, you'll hear the echo of a solitary clap and the final Dark Curtain will fall. One of the best games to ever hit the SNES. It's still difficult til this day. Love it! I've beaten this game many times yet it's still one of the most frustrating games to me. 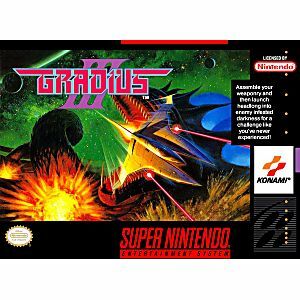 I've always loved the Gradius series and this is my favorite one of the bunch. It's my go to for when I just want to zone out from a long day. It's a must have in my opinion! This is probably my personal favorite SNES shooter. It is a close call between EDF and Gradius III. 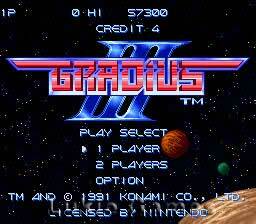 I think the Gradius series is very solid and the music of the series is some of my favorite. This game is great and I enjoy playing it, but be sure to look up the 99 lives code cause you will need it! Very fast paced scrolling screen shoot'em up. Great game! I received the cartridge in excelent condition. Beside that, the game speaks for itself. It's hard, but it's awesome! Arguably THE best shooter on the Super Nintendo. Set the standard for the shooter genre. If you get any shooter for the SNES get this one......it does not disappoint. Very good game, Would recomend it to others. Realy like this game , good memories playing it maybe not the best one but sure a fun one. Thx to lukiegames the cartridge was in good condition and got no trouble with it. definetly my new best retro game purchase site !! One Of The Best For SNES! This may not be as well as known as say Zelda or Donkey Kong, but this is one of the best games for the SNES! It falls in with the greatness of the Donkey Kong Country games, The Legend Of Zelda: A Link To The Past, Chrono Trigger, EarthBound, Super Mario World, the Final Fantasy games, and Super Mario RPG Legend Of The Seven Stars, all for SNES! This way you know what I'm talking about. The game actually IS the best, music wise. It consists of difficulty level setting. And is really difficult nonetheless. If your ship explodes (if you die) brace yourself for the most unpleasant sound you'll ever hear. The dying sound is so unbearable, it makes you try so much harder not to die. So, you die, your ears die also. It's a side scroll shooter. You can choose a set of weapons already made, or make your own. 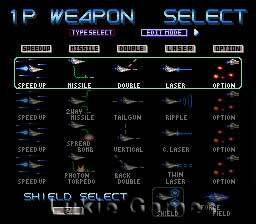 you can shoot missiles, lasers, beams, shield yourself in various ways. The further you progress, the more surprises enemy wise you get, and the difficulty as well. 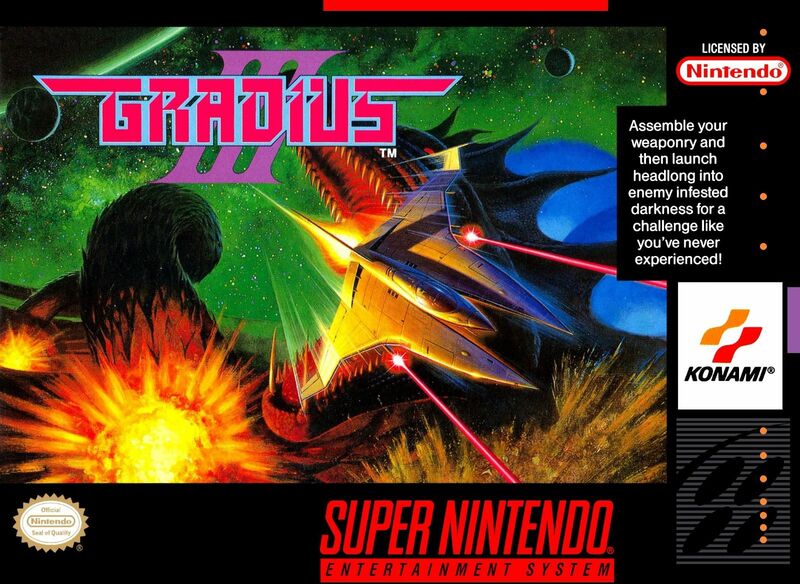 If you do not know about the Gradius series, or like it without even playing their games, Then this game is sure to get you involved here. As for the lukiegames.com 's part, perfect, item in great condition. And many reviewers don't try again if they actually recieve a bad copy, so they write bad reviews. All you have to do is send the game back, and lukiegames will make sure the 2nd time your new copy will be absolutely perfect. I first had recieved a copy of Super Smash Bros. for N64 and it was broken, but i shipped it back and asked for a replacement, not much time later, I got the best game in the world! Which IS Super Smash Bros. lukiegames is the place to go anytime you need a game that isn't entirely new, like this date's Wii U and 3DS. But they carry the 2nd newest options, DS and Wii, PS3, ect; can't be a really old game either, or a japanese import. But WHO CARES, what they have is PERFECT! Quick Ship, game in really good condition and works great! This site is awesome!! Works great! Love this game!